Hijama Treatment of an Acute Ankle Injury – a case study By Dr Rizwhan Suleman (Mchiro). The following is a hijama case study kindly contributed by Dr Rizwhan Suleman from Cardiff, Wales (see previous post dated 3 May, 2009: A comparison of Hijama (Cupping Therapy) with Chiropractic). 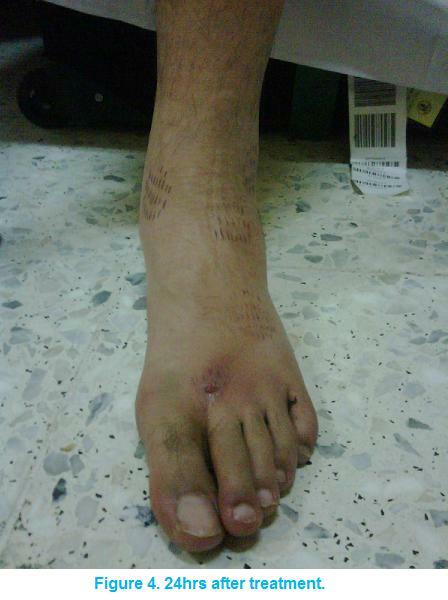 A 24 year old Caucasian male country yard worker presents with an acute left ankle sprain injury. Onset was 5 days prior during an epileptic seizure. The exact mode of injury was unknown; the patient noted diffuse ankle swelling gradually over a period of half an hour, with no noticeable bruising or discolouration. Since the injury the patient has been wearing an ankle support and has been using ice but has not reduced his daily activities which involve 2-3 hours of walking. The patient noticed the swelling was progressing distally to the toes and proximally up the shin. He also described an insect bite between the toes, which occurred after the injury, as being infected. The patient suffered encephalitis at the age of 17 and made a full physical recovery following a 2 month state of comatose. Subsequently the patient suffers with unprovoked seizures that have been gradually decreasing in frequency over the years, from 8 per day to the current, 2 per week. The patient saw his GP who prescribed non-steroidal anti inflammatory medication for the injury and anti-histamine and antibiotics for the infected insect bite. X-rays were taken and reported no abnormalities. Antiepileptic medication, NSAIDs, anti-histamine and antibiotics. Blood Pressure, heart rate, respiratory rate and temperature were all within normal range. The patient was 5ft 10, slim built and walked with an antalgic gait. 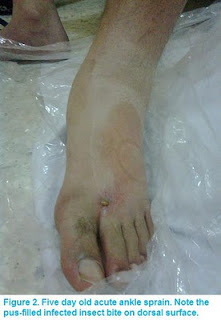 There was diffuse swelling of the left foot, ankle and distal shin when compared to the right. There was a pea sized septic skin lesion between the dorsal surface of the 1st and 2nd distal metatarsal heads (see figure 2). There were no obvious structural deformities. 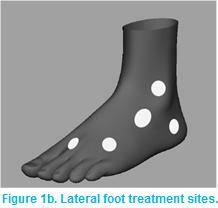 Range of motion was markedly reduced in the ankle joint and produced pain on both active and passive motion. There were heightened pain levels on inversion of the foot. Muscle testing gave sufficient resistance in all planes. Vibration testing was negative on all bony structures. Soft tissue palpation elicited focal tenderness over the lateral ankle ligaments. In assessing the risk of a treatment initiated seizure, the patient was laid supine on the floor and a dry vacuum cup was applied to the hand. In the absence of any prodromal symptoms, a further cup was applied to the asymptomatic foot. 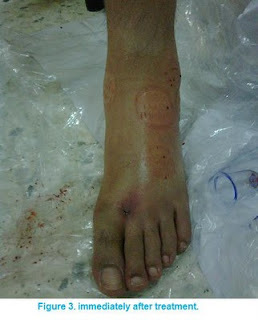 With the patient reporting no adverse symptoms, wet cupping (hijama) treatment was initiated on the symptomatic foot. Due to the degree of swelling several medium to small size cups were applied to the foot and ankle in consecutive sets of 2-3. 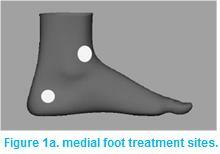 Positioning of the cups was aimed at reducing swelling in the toes, ankle and shin but was also influenced by the irregular surfaces of the foot and ankle making cup application difficult (see figure 1a & 1b). A single cup was applied to the site of the infected bite which aspirated a quantity of green/yellow fluid. General RICE treatment advice was given and the ankle dressed. Immediately after treatment there was a noticeable reduction in swelling (see figure 3). The patient reported feeling less pain and had a slight increase in ROM. On 24 hr follow-up there was a marked reduction in swelling, pain and ROM (see figure 4). On 1 week follow up the reduction in swelling was maintained and the patient was able to walk on the ankle with only a small amount of pain. Wet cupping (Hijama) in this case was an effective treatment in aiding the recovery of an acutely sprained ankle. While reviewing the different treatment options for this type of injury, it becomes apparent that there are few options that can claim to give such an accelerated progress in its management. In the context of sporting injuries where recovery time is of upmost importance this treatment may become a preferred option. Further case studies of a similar nature will help gain more insight into the benefits of wet cupping (Hijama) in such contexts. Our thanks to Dr Rizwhan Suleman from Cardiff, Wales for sharing the above post. If you have any questions for Dr Suleman or indeed have been treated by him and want to leave him a testimonial, then please do so via a comment* below.